South Africa was the largest importer of Vietnam in the continent in 2018, spending 724.3 million USD on purchasing Vietnamese products, followed by Egypt with 439 million USD and Ghana with 278.3 million USD. Last year, Vietnam’s imports from African nations fell 10 percent to some 3.6 billion USD, helping reduce the trade deficit to 0.6 billion USD. The country had high demand for fuel, animal food, cotton, wood, copper and materials for domestic processing and exports. Although Vietnam-Africa trade ties have made giant stride in the past years, an array of challenges face Vietnamese firms in the continent. Besides political instability in some nations and fierce competition with China, Thailand and India, a shortage of strategies for African markets has hurt Vietnamese corporations. Also, they are concerned about online payment scams by swindlers from Nigeria, Benin and Togo. Despite this, the department foresees a bright outlook for Vietnamese exports to Africa in 2019, where extreme weather and political instability have made it hard for countries to produce sufficient products for domestic consumption. African countries’ economic growth is forecast to continue expanding.. Local residents will spend more, especially on seafood, garment and textile products and footwear products of Vietnam’s strengths. 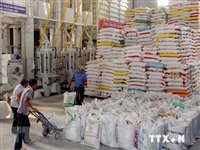 In addition, competition with foreign rivals is not a big problem when Vietnamese products are already favoured by many African customers, who have diverse requirements for quality of the imports./.